Crater Camp is a unique place. It is the highest campsite on Mount Kilimanjaro. It is located just 340 feet lower than the summit, Uhuru Point. We offer the opportunity to stay at Crater Camp on the Lemosho and Northern Circuit routes. This option will add one day to the standard itineraries making them the 9 Lemosho Crater Route and 10 day Northern Crater Route. We leave for the summit during daylight hours and stay at Crater Camp after the summit for better acclimatization. On all other Kilimanjaro routes, only the guides and clients summit while the rest of the mountain crew remains at high camp (i.e. Barafu). Using Crater Camp requires significantly more effort on our part as the entire mountain crew, along with all of the expedition equipment, has to ascend 4,000 feet higher than they normally would. Therefore, there is considerable added cost to do a Crater Camp route. From Crater Camp, one can take an optional one hour hike to Reutsch Crater, or simply explore the areas around Furtwangler Glacier. Reutsch Crater is a magnificent sight. It is almost perfectly circular and the ash pit measures 400 feet (120 m) deep and 1,300 feet (400 m) wide. This is rarely seen by tourists. We understand the attraction of staying at Crater Camp. However, the drawback of sleeping at this high altitude is that it is pretty dangerous. Serious AMS can develop if adequate altitude acclimatization has not been achieved. Due to safety concerns for clients and staff, these routes are done only by special request and are subject to approval by Eco-Africa Climbing. During normal morning hours, we begin our push to the summit. This is the most mentally and physically challenging portion of the trek. We ascend for several hours at a slow but steady pace while taking frequent, but short, breaks. The trail turns into heavy scree as we make the steep climb to the crater rim. At Stella Point (18,900 ft), we see the summit sign in the distance. We continue the around the crater rim until finally we arrive at Uhuru Peak- the highest point on Mount Kilimanjaro and the continent of Africa. We then descend a short distance to Crater Camp, where the rest of the staff will join us to set up camp. There is an option to hike to Reutsch Crater and the ash pit, or simply explore the areas around Furtwangler Glacier. Sleeping at this high altitude can be dangerous. Serious AMS can develop if adequate altitude acclimatization has not been achieved so the guides will monitor you very closely. From Crater Camp, we now make our descent continuing straight down to the Mweka Hut camp site, stopping at Barafu for lunch. The trail is very rocky and can be quite hard on the knees; trekking poles are helpful. Mweka Camp is situated in the upper forest and mist or rain can be expected in the late afternoon. Later in the evening, we enjoy our last dinner on the mountain and a well-earned sleep. 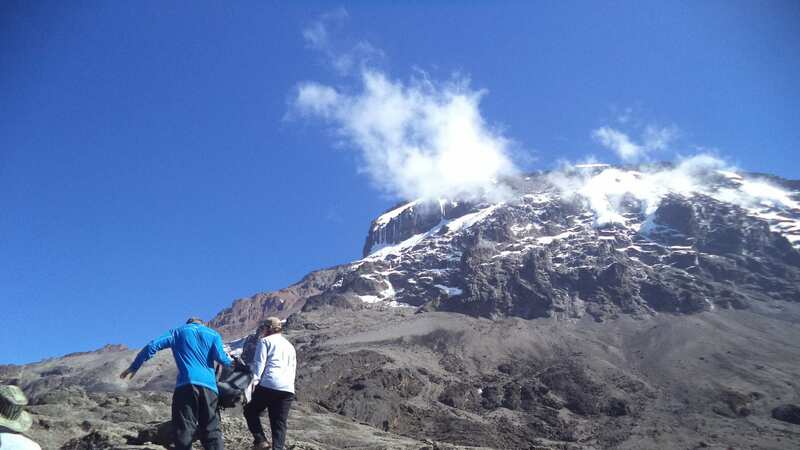 We climb steadily up and over the “Saddle,” which sits between Kibo and Mawenzi. We continue on to our camp, School Hut. Once here we rest, enjoy dinner and prepare for the summit day. During normal morning hours, we begin our push to the summit. This is the most mentally and physically challenging portion of the trek. We ascend for several hours at a slow but steady pace while taking frequent, but short, breaks. The trail turns into heavy scree as we make the steep climb to the crater rim. At Gilman’s Point (18,600 ft), we see the summit sign in the distance. We continue the around the crater rim until finally we arrive at Uhuru Peak- the highest point on Mount Kilimanjaro and the continent of Africa.